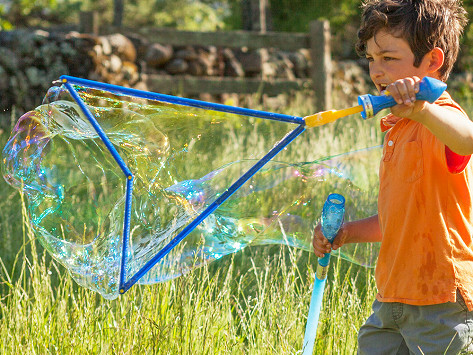 Play with bubbles that are way bigger—and way more fun—thanks to this giant bubble wand. The sword-like design expands to make extra-large bubbles that will blow kids minds. And with Uncle Bubble’s unique bubble solution, the bubbles are stronger and last longer, too. Dimensions: 30" x 4" x 2"
I bought 4 of these for the grandkids and they enthusiasticly reported how much fun these are and they actually work! I gave one to a 10 yr old last Christmas, and he loved it - and it looked like a LOT of FUN! I just bought 2 more - one for another young person and the other to keep for a future gift. Why does it have to be a weapon? Classic bubbles get a bigger, bouncier upgrade with Uncle Bubble. 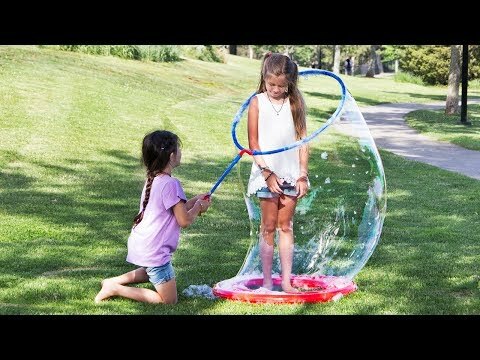 They make giant bubble wands and a unique bubble concentrate that results in more kid-pleasing fun. Jack and Andy Lin are the father-son duo behind Uncle Bubble. They’ve been working on bubbly innovations for over 30 years, and their bubble solution is the foundation for all the fun. This non-toxic concentrated liquid makes stronger bubbles that are less likely to pop. It’s mixed in small batches—by hand!—by members of the Lin family only. Their wands give kids a new way to play with those bigger, bouncier bubbles. The sword-like Unbelievabubble wand has an expanding design, and the Megaloop wand and dipping pool combo creates people-sized bubble tubes. Now heading outside to blow bubbles is a whole new way to have fun.